Do you ever find odd things on your camera that you're sure you didn't take? Oh my - We have a 7th grader and a 10th grader in the house! Please forgive the pictures, they were impatient and hate this first day of school photo tradition of mine. 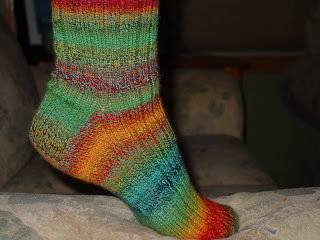 I finished the first sock of a pair of socks for me. 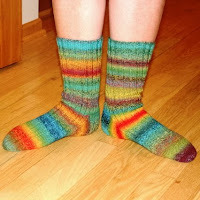 I used the new Ann Budd book "Getting Started Knitting Socks" and her 8 stitches per inch pattern. 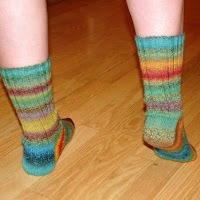 I used Trekking XXL yarn and a size 2 US set of Bamboo DPN needles.The first 20 rows are K2, P2 ribbing (2 inches) and then I did the leg and the top of the foot in K3, P1 ribbing. It fits well, doesn't feel loose or tight so must be perfect. I tried the kitchener join on the toe but got frustrated and gave up. The 3 needle bind off inside was fine. Then I started sewing in the ends and discovered this random floater of yarn... must have entirely skipped a needle! ARGH.